Shiloh was originally named "Hunter" aka AlaDars Something On The Go. He had one crooked tooth and was sold as a pet. When he was about one year of age the family decided they wanted to return Shiloh due to housing changes. I was aware of the Beagle Brigade and thought Shiloh would be a good candidate. He was sent ot the Orlando testing facility. I asked that his name Hunter be used but since there was already a Hunter in the BB he had to use the name his original family had given him. He was tested and wowed them in the test. "It has been a few years, but I wanted to let you know what I thought of Shiloh when he was going through training. I have trained quite a few dogs in my life span and I can say without reservation, that Shiloh is in the top five dogs that I have ever trained. His food drive is exceptional. He stays focused on the handler all the time. He is a very intelligent canine! Very seldom would he look away from me for fear of losing the opportunity to get that treat. If I ignored him long enough, he would start offering me behaviors such as, rolling over, sitting pretty or staying in the down position, while looking at me for some sort of acknowledgment. I always ended up surrendering to him laughing and smiling and giving him praise and the long awaited, but worked hard for, TREAT. Shiloh was a joy and pleasure to train. I just wish we had more like him. National Detector Dog Training Center, NDDTC"
After training he was sent to LAX and matched with his handler Donna. Over the years Donna and Shiloh made history and set a high standard. 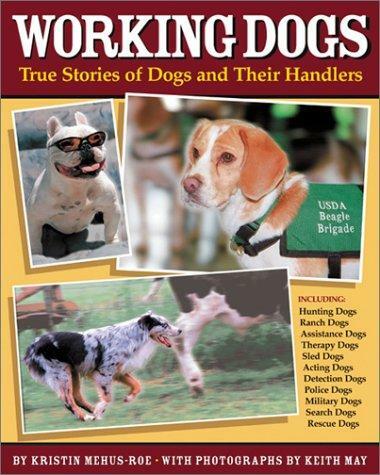 He was also featured on the cover of a book about working dogs. Shiloh had a medical scare when he was diagnosed with cutaneous lymphosarcoma. All the skin lesions were removed and his retirement was planned. After his recovery period and with no indications of lymphosarcoma being present internally he was allowed to go back to his "job" that he dearly loved. In December 2008, Shiloh was retired due to an age limitation policy dictating mandatory retirement. Shiloh went home to live with his long term handler and live the life of beloved pet. Donna keeps in touch with me and Shiloh is adjusting well to retirement. UPDATE!! Shiloh crossed the rainbow bridge in early February 2016 due to cancer. He is greatly missed by Donna. He was a once in lifetime dog.! WE ARE AS PROUD OF SHILOH AND HIS ACCOMPLISHMENTS AS ANY OF OUR CHAMPIONS. HE PROVED HE IS TRULY BRED TO USE HIS NOSE AND SHOWDOGS CAN BE MORE THAN JUST A PRETTY DOG. Customs officials, officers and four-legged colleagues turn out for Shiloh's retirement party. The dog reaches the mandatory federal retirement age of 9 next week. The khat dog sniffed out his final smuggler at LAX on Tuesday. 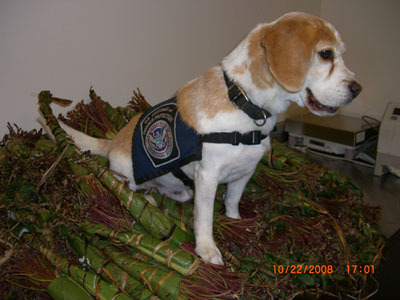 After that, Shiloh the beagle high-tailed it home to Long Beach to live the high life with his handler, U.S. Customs and Border Protection Canine Enforcement Officer Donna Kercher. For nearly eight years Shiloh's keen sense of smell uncovered fruits, vegetables and other foods possibly infested with dangerous insects that were carried illegally into the United States by international travelers. an east African and Middle Eastern plant that contains a stimulant called cathinone. It wasn't the first time he had zeroed in on khat being sneaked in. His nose for naughtiness made him top dog at the Bradley International Terminal, where LAX first employed beagles as sniffer dogs in 1984. But as a government employee, Shiloh always faced a mandatory retirement age - in his case 9. On Tuesday, he padded through the terminal arrival area one last time, giving bulging bags rolling off the huge luggage carousel the sniff test. When he found something suspicious, he sat down, alerting Kercher that something was amiss. Sometimes it's a false alarm. Food or fruit brought onto the plane as an in-flight snack was eaten en route, but left its scent behind. Other times, apples or bananas tucked into carry-on luggage in Addis Ababa or Bangkok went uneaten and forgotten. But the threat to U.S. agriculture from pests such as Medflies and guava flies, or of diseases carried in meats, is significant enough that incoming food and plants must be seized and destroyed, officials say. Over the years, Shiloh has detected more than 20,000 prohibited agriculture items, said Kercher, 40. With his friendly tail-wagging, he's managed to do it in a non-threatening way too. Kercher will continue as an agricultural enforcement officer working solo, checking bags by unzipping each of them and poking around corners and into containers with her gloved hands. What a trained agriculture dog can do in seconds takes 15 or 20 minutes for a human officer to do fully. "I'll miss the passenger interaction, parents teaching children about working dogs. That's really been fun," she said. "I'm so attached to Shiloh. I don't know if I could get another dog like him." During his final rounds Tuesday, Shiloh wore buttons stating "It's my last day -- 'Bye" and "I'm retiring" pinned to his uniform -- a blue vest that bore the Homeland Security emblem and the motto "Protecting American Agriculture." Attached to his collar was a tiny gold U.S. Customs and Border Protection badge with the number 58. 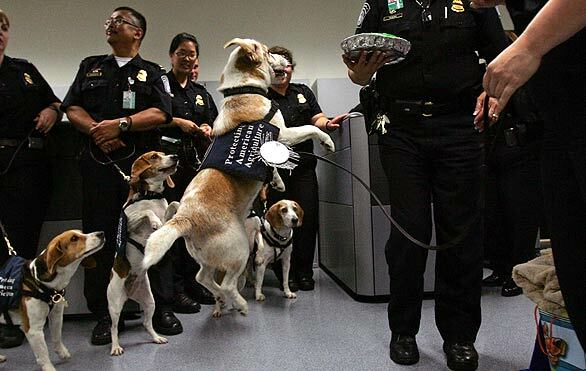 A new plant sniffer is joining LAX's 10-dog beagle brigade starting today. But on Tuesday, seven members of the canine corps lined up with their handlers to say goodbye to Shiloh. About 25 other agriculture officers and border protection agency Port Director Carlos Martel joined them. Supervising inspector Diana Verity laughed as she recalled how Shiloh once alerted Kercher to a luggage cart piled with numerous bags. Kercher "asked which bags? And he put his nose on two different bags. Turns out there was fruit in both bags." "Another time he found a sausage hidden in a concealed place in a bag. He's awesome," said Verity, herself a former canine officer. Shiloh and other baggage beagles never get to eat what they find. Instead, they are rewarded with doggy treats from their officer-handlers. But on Tuesday a canine cake was served in Shiloh's honor at his retirement party. Another agriculture dog handler-officer, Leticia Hale, baked it with peanut butter, carrots, flour and honey. "He's allowed to eat it. He's a civilian," joked U.S. Customs and Border Protection inspector Michael Fleming. As the other beagles watched with tongue-dripping envy, Shiloh eyed the cake and then looked at Kercher for approval. She said yes. Shiloh didn't turn up his nose at his one last airport treat. Pool is a Times staff writer.